At one point in the evening, I introduced John Carnera to Pierre Corthay. 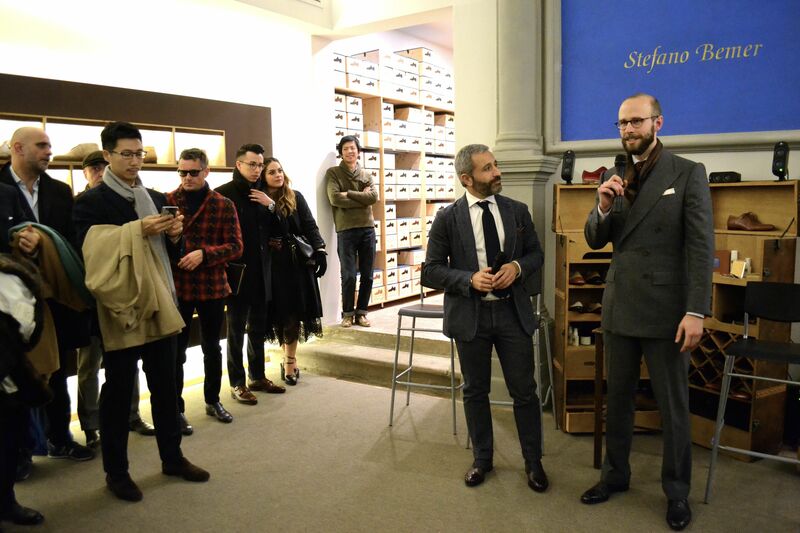 These two titans of bespoke shoemaking – and gentlemen both – yet of course they had never met. Later, at the Villa Cora party, it was introducing Edward Sexton to Luca Rubinacci; then Nicoletta Caraceni to Lorenzo Cifonelli. 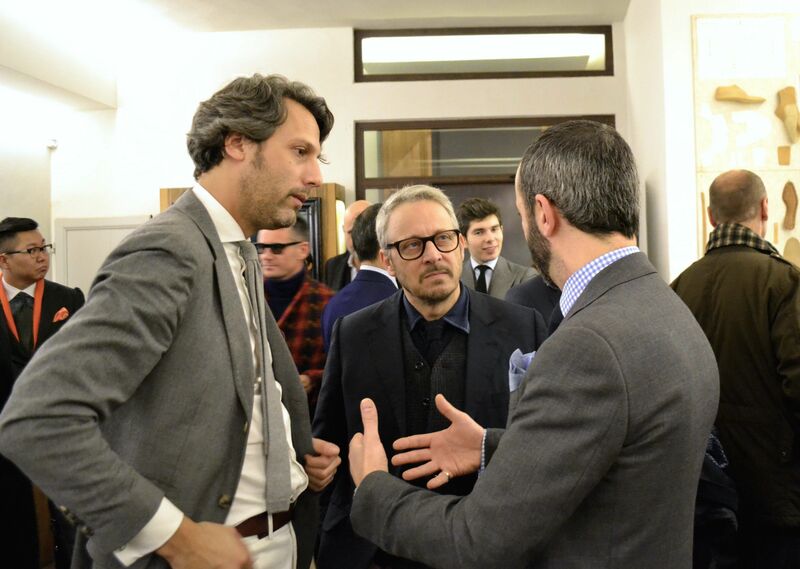 The highlight of the shoe symposium we organised this week in Florence was bringing these wonderful craftsmen together. It’s so easy to assume people won’t get along – indeed, one maker commented that they had been told that another maker was arrogant and dismissive. They were so pleased to find out that that wasn’t the case. At the roundtable discussion itself, which I chaired at the Stefano Bemer workshop earlier in the evening, the mood was similarly congenial. Everyone admitted they were inspired by others’ shoes; everyone praised each other’s work; everyone expressed real optimism for the industry. There was talk of more official collaboration, even a club or association. Everyone loved meeting John Carnera (Cleverley, now semi-retired). It helped that he knew Italy and spoke fluent Italian, of course. But his longevity also brought many of the themes of the evening together. When he joined in the 1950s, his employer asked him why he was getting into the industry – it would be dead in 10 years. 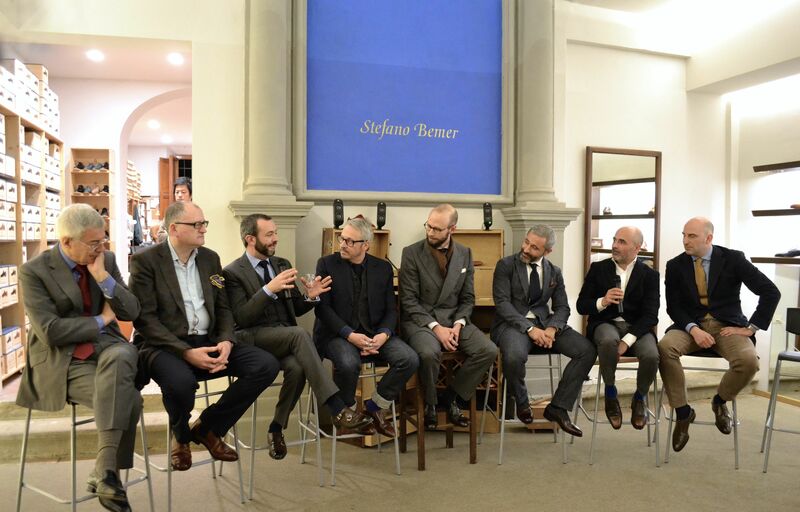 The symposium brought in most of the finest makers of both bespoke and RTW shoes in the world: Cleverley, Foster’s, Gaziano & Girling, Corthay, Saint Crispin’s, Norman Vilalta and Stefano Bemer. Stefano’s spirit was everywhere – his generosity was remembered by Norman (who trained under him) and of course by current owner Tommaso Melani, who is endeavouring to continue Stefano’s legacy. 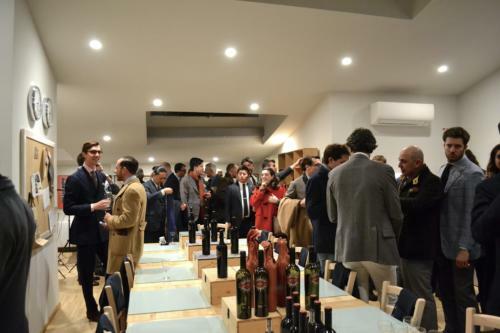 We had drinks and general discussion for about an hour, with our friends from Isetan, The Rake, Anderson & Sheppard and many more examining the shoes of the various makers – serried around the walls – and exploring the Bemer workshop (particularly the school on the top floor). Actually, the loveliest part of the whole affair might have been meeting Ravi, a young guy who read my post on the Bemer school while having lunch with his family last year. After 20 minutes, he had convinced his father it was a good way to spend six months, phoned up Bemer and secured the last place on this year’s course. I know it sounds naff, but it warms the heart. It really does. After that hour of milling around, one representative from each shoe company took a stool at the front, and we began the roundtable. Questions included: how do you find producing bespoke and RTW inform each other? What do you think we need to push the industry forward? And which is your favourite shoe? Collaboration and education were the answers to the second question, and interestingly most people picked a simple, pure shoe for their favourite. Tony (Gaziano) went for a black whole-cut; Pierre for a black derby; Philip Car from Saint Crispin’s choice was blue-black, but the philosophy was the same: single, dark colours put the emphasis on the lines of the shoe, which most agreed were the most beautiful part of it. Many, many thanks to everyone that came, both makers and audience. I’ll post some pictures of the Villa Cora party later. You can follow the discussion on BeShoes: The shoe symposium at Pitti Uomo by entering your email address in the box below. You will then receive an email every time a new comment is added. These will also contain a link to a page where you can stop the alerts, and remove all of your related data from the site. Good work Simon, and which suit are you wearing there? I think it’s pretty remarkable. Bravo for the upcoming feature Sexton! Ozwald Boateng’s got an MBE. Edward deserves more bloody recognition! Good post. Interesting that whilst you were cheering the round table, only you was cloaked in a scarf and a DB to boot? Was the roundtable held alfresco or were you just really cold, Simon? Hi Simon, It must have been quite an event. Great idea! I’d love to see a symposium & expo with all the top shoemakers which the public could go to. They could meet the craftsmen and see all the best shoes from around the world in one big room. Heaven! What were you wearing on the evening Simon? It sounds like it was a fantastic event. Congratulations. I look forward to seeing some more photos. A great initiative Simon and seems like a great event! Really sad that I couldn’t be there. Noticed that Riccardo didn’t participate in the panel discussion, what happened to him? Don’t think you’ve ever posted on them so presume you haven’t had any direct experience, but just wondering if you had heard anything good/bad about Cad & the Dandy? This gathering is really a great idea! Bringing these highly skilled craftsmen together and also raising a sense of their journey taking place in the same boat will be conducive to new ideas – either from themselves or about them – and better prospects for the industry as a whole. That’s how I see the meaning of this initiative and its potential outcomes. I’m looking forward to seeing the pics of the event! Simon, congratulations on organizing the event! This really does push the bespoke industry forward (and benefits everyone — including customers). What a fantastic idea and what a shame that we couldn’t be there too…when we launch the ready to wear perhaps? The symposium is a great idea to bring shoemakers together to talk to each other! As your reader suggests, extending it to become a public event as well would be interesting. Something for the future with the right sponsor perhaps?